Having lived in Staplegrove for the past 18 months we were pleased to be invited along to take part in the local community Jubilee celebrations. 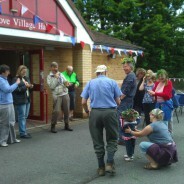 The treasure hunt kicked off at 2.30pm from Hudson Way and ended at the Staplegrove Village Hall. There was a great turnout with several in fancy dress and many opting to cycle.